There’s this common misconception you have to be an expert in something for you to get paid big. Fortunately, that’s not the case in the amazing and highly profitable world of wholesaling. And the story of this episode’s guest is a testament to this fact. Trey Avey is a relentless wholesaler from Tacoma, Washington. While he’s still new in the wholesaling world, that didn’t stop him from finding deals and making things happen. In essence, what Trey lacked in experience and expertise, he made up for in determination and willingness to fail his way forward. 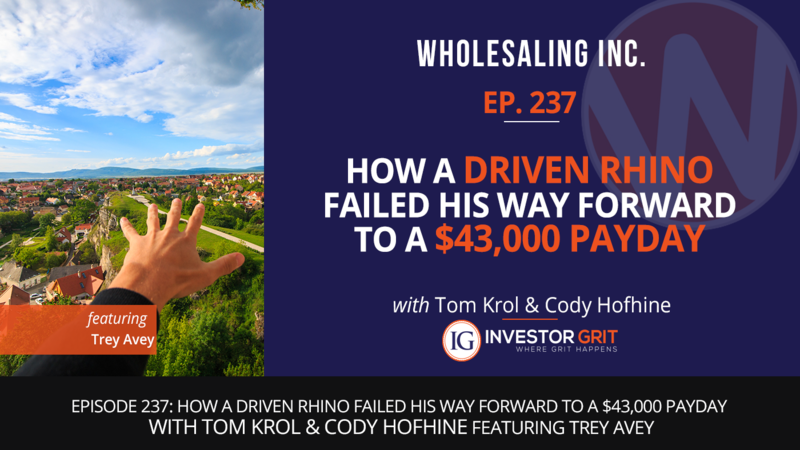 If you’re considering getting into wholesaling but hindered by your lack of knowledge and experience, today’s episode is for you. Without doubt, Trey’s story will inspire you to finally give wholesaling a go! Trey sent postcards to the code violation list he pulled online. From there, he found a highly motivated homeowner looking to sell an inheritance property. After putting in an estimated 25 hours of work, he was able to buy the contract for $120,000, sell it for $163,000 and walk away with $43,000 in profit! That’s more money than some people earn in a year!